Raleigh Specials Tonight: Bring on the Beer for the New Year! Bring on the Beer for the New Year! Champagne is great and all, but I like my beer. 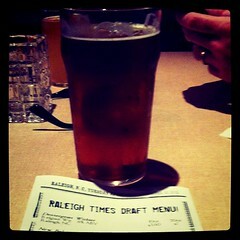 A couple of my favorite spots for beer drinking are The Raleigh Times and Draft. The Raleigh Times is hosting "no cover" New Year's Eve Party and will have a $10 prix fixe meal available after 5 PM. If you spend NYE at Draft, purchase a $20 bottomless glass for all 44 of their drafts!